Social media is a great place to be in for brands in 2017. With more people logging in multiple times a day, there’s no better medium to reach the wi-fi enabled. And that’s exactly what brands from the QSR industry in India did. 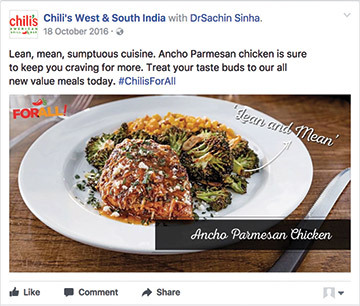 In this report by Unmetric, we take a look at the social media landscape of quick service restaurants and take a deep dive into the performance of 15 brands. Brands Analyzed: KFC, Domino’s Pizza, Cafe Coffee Day, Pizza Hut India, McDonald’s, Starbucks, Dunkin’ Donuts, Subway, Taco Bell, Burger King, Costa Coffee, Chili’s West & South, Chili’s North & East, Coffee Bean & Tea Leaf, Papa John’s Pizza. Organic reach is dead and it doesn’t matter how many fans a brand has. However, a steady growth in community size is a healthy sign of brand efforts paying off. 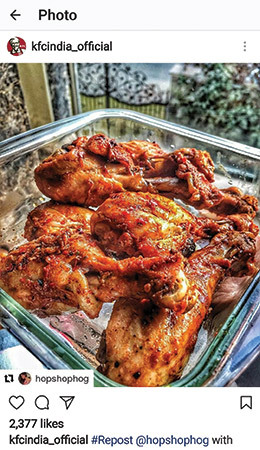 With an audience base of 7.5 million, KFC had the most number of fans in India while Chili’s West & South India had the highest growth rate of 66%. 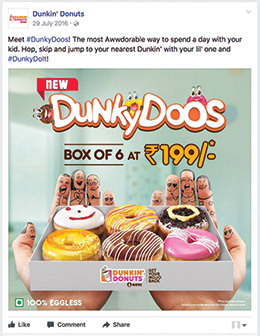 Domino’s India was one of the most prolific publishers of Facebook content. In all of 2016, the brand posted over 1100 times — that’s almost 3 times a day. 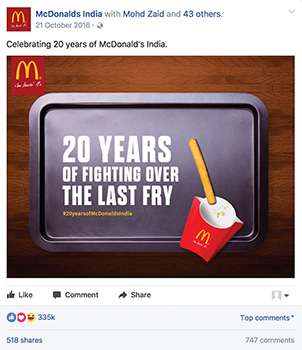 The brand also received the most likes, comments, and shares on it’s Facebook content. However, in terms of average engagement, Dunkin Donuts did better even though they posted only 200 times in the whole year — less than a fourth of what Domino’s published. Domino’s was the brand to promote the most posts. Almost 62% of their publicly visible content was promoted. Among the brands analyzed in this report — brands on average promoted 38% of their content. This gave the brand an estimated reach of 143 million, the highest among the brands analyzed. On Twitter and Instagram as well, Domino’s was the brand to publish the maximum content. This put them in the top 5 on both networks in terms of engagement. In total, the 15 brands put out 5352 Facebook posts, 6465 proactive Tweets, and Instagram posts. We used Unmetric’s Engagement Score to pick out a few of the best performing content pieces. In all of 2016, Unmetric was able to track over 130 social media campaigns run by these 15 brands. Common themes included offers, festival greetings and new menu item launch. 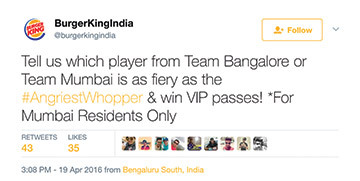 Burger King relaunched their classic menu item with #BiggBossWhopperIsBack2016. The campaign ran towards the end of October and was made of 10 Tweets and 2 Facebook Posts. 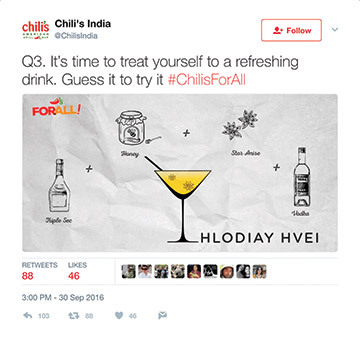 Given how hashtags allow users to discover similar posts and consolidate all related content under one umbrella, this is a smart strategy that is working well for these brands.Coining the right hashtag is both an art and a science. While we’ve written a lot about that in the past, one of the things we noticed about the most popular hashtags among brands analyzed is that they all used their own brand name as a hashtag. And so did users. On Twitter, acknowledging and responding to customer queries has become essential. Whether a person has a complaint, or simply has a question, the digital audience expects prompt response. In the QSR industry, the majority of brands seems to be following a trend of asking the user to DM the brand so as to take the query off public view and to also individually handle concerns. Content publishing is not simply about creating engaging stories. It is also about presenting them at the right time. For the QSR industry, brands seem to find their engagement sweet spot on Mondays between 6 and 9 AM. 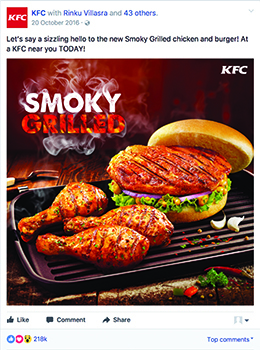 Sounds like people look forward to a quick and tasty lunch on a Monday morning! Every month we publish the Melt Magazine, which takes a deeper, more analytical look at the industry of marketing and media in India, including features contributed by experts in the field. To subscribe to Melt Magazine or to buy any of our older issues, email queries@kyoorius.com. Toilet Rolls – How Do We Impress Our Audience?